These grey egrets earn their name for their slate-like colour. They earn their notoriety due to the fact that they are so rare, and are a real treat for many Okavango birding enthusiasts to see. The Slaty Egret looks like a grey version of Black Egrets and some tourists may wonder what all the fuss is about. 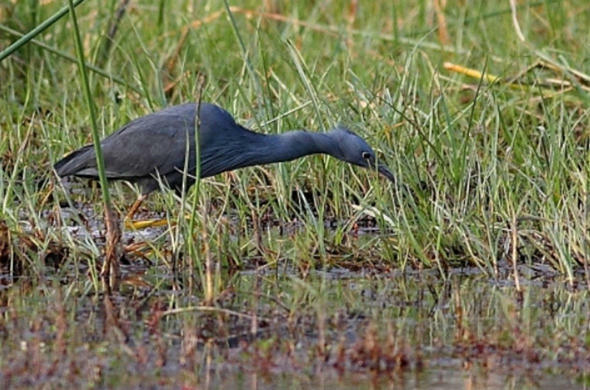 The allure of the Slaty Egret for birders is that it is rare and is near endemic to the Okavango. Meaning it is found just about nowhere else. This is why avid twitchers get excited about seeing this grey Egret.The Slaty Egret is not a difficult bird to see in the Okavango, but it is still a highly prized sighting. They are fairly widespread throughout the Okavango. They prefer shallow lagoons where there is short grass which is the ideal habitat for the small fish, small frogs and invertebrates which they feed on. Slaty Egrets face competition for food from other Egrets, Spoonbills and different species of Herons, but they seem to be thriving in the Delta. They look similar to the Black Egret but are distinguished by their colouring. They have slate grey feathers and yellow legs as opposed to the Black Egrets black legs. They are also distinguished by their vinous/brown throat. Their eggs are indistinguishable from those of similar species.Their breeding grounds are very different from their feeding grounds. They build a scruffy platform out of detritus in the middle of thick reeds. They lay light blue eggs in the middle of the nest. The eggs are laid a day apart and the chicks hatch a day apart. The chicks clamber about the nest till they are able to fly.